Such vague sources leaking info from the manufacturing industry have been hit or miss in the past, and when on the scent, they have sometimes been way off on the finer details. Here, like the saying “where there’s smoke there’s fire,” the frequency and volume of speculation surrounding a netbook does suggest a new product is in fact in the pipeline. The question is – what is it? Is Apple really pursuing the fabled netbook? 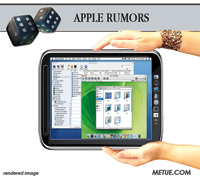 Or is a long rumored tablet computer, as some sources (like Apple Insider) speculate, in the works? Or is it something else? Apple’s earnings announcements later this week aren’t likely to divulge any secrets. At this point, it’s anybody’s guess what product surprises Cupertino has in store for the remainder of this year…. and based on the news, there’s no shortage of those guesses out there.